That will make you swallow hard, won’t it? According to the National Fire Protection Agency (NFPA), 46% of fires are fast-burning, and often, cooking related but the remainder happen largely due to smoldering materials which are slower burning. The least expensive and therefore most common smoke detector is called an Ionization smoke detector. While this style is really good at detecting fast burning fires and burnt toast or popcorn, it is not very good at all for detecting smoldering and slow-burning fires. A more recent style, Photoelectric smoke detectors, have been around at least since the early 1990s but few people seem aware of the benefits and differences in both technologies. A study performed by Underwriters Laboratories (UL) in 2007 (Available HERE) found that in specific cases, a photoelectric smoke detector was triggered 2.3-22% quicker than the ionization type. The most common types of fires that kill are the smoldering type. Incidentally, this is where Ionization type detectors are not as effective. in real terms, this can be a response time difference of of more than 15 minutes. By this time, escape could be impossible. While a photo-electric alarm is not triggered as quickly by bread/burnt toast, this is generally considered a nuisance type alarm [toast COULD start a more serious fire, but the smoke created is enough to alert most alarms and people quickly enough to get out]. While the article is a bit dated now A Twin Cities home inspector found in an informal survey that smoke detectors in most homes he inspected (Star Tribune, 2012) were the ionization type. It’s little wonder since the cheapest smoke detectors at around $5 each are the Ionization type. This is often the quick fix for sellers who are asked to replace smoke detectors for buyers. The best plan, however, is to include both types of smoke detectors in your home to protect the people you love. Aesthetically, people don’t get excited about smoke detectors because they are often white (or beige from fading) and don’t add to the look of the decorating. I’m a fan of the Atom from First Alert for this reason. It’s small, easy to install and its photoelectric. Whatever brand or models you choose, make a point to have both photoelectric and ionization type smoke detectors in your home, and make sure to test them regularly. If you own a home, make sure your smoke detectors are up to date. They should be replaced per manufacturer’s instructions (usually within 10 years or less of install). If it’s time to install new ones, consider a mix of smoke detector style in your home that includes ionization and photoelectric types. 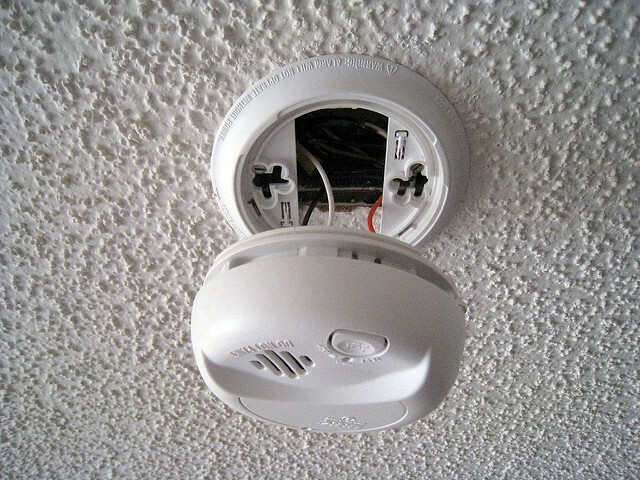 If you are buying a home, It would be wise to plan and install new smoke detectors throughout the home. At minimum, inspect and verify the date of install and manufacture on the backside of the units. If this cannot be determined, don’t risk it. In either case, test smoke detectors regularly and verify that batteries are replaced in units that do not have sealed batteries, and NEVER remove or modify a smoke detector to make it unusable.